If you’re feeling a little jaded with the online casino experience and are wanting something a little more interactive and exciting you might want to try a live dealer game at an online casino UK. There are a variety of live dealer games available to play, but for now we’ll be concentrating on live dealer poker. With a live casino experience you can enjoy the thrill of a bricks and mortar establishment, through a desktop or mobile device. Playing live online casino poker is really rather easy and is fast becoming the most popular way to play poker online. What is live dealer poker online? The name is pretty much self explanatory. An online casino offering live dealer poker will have real dealers to deal the cards, take the bets and declare the winners. And it’s not just poker you can play. Blackjack, baccarat, Caribbean Stud, Casino Hold’em, roulette and a number of other table games can also be played. The games are streamed via live feed to your desktop or mobile device. They take place in special gaming studios owned by a number of companies. Evolution Gaming is one provider, along with NetEnt and Playtech. These large companies have the resources required to set such a service up. They are responsible for employing and training the staff. The games that are played are then licensed out to various online casinos. Just a few years ago, this type of online casino poker experience wouldn’t have been possible. However, thanks to advancements in technology, players can now enjoy playing at a table with live dealers, sharing a table with other players and also enjoying a spot of friendly banter. What are the advantages of playing live online casino poker? A big concern for many online casino players is the fairness of the games. After all, the games are run by computer software. Players aren’t always happy to put their trust in computer software and can be worried about the games being rigged and the casino edge being bigger by design. This kind of fear is a little misguided because independent auditing agencies such as eCOGRA regularly check the games and certify to their fairness. 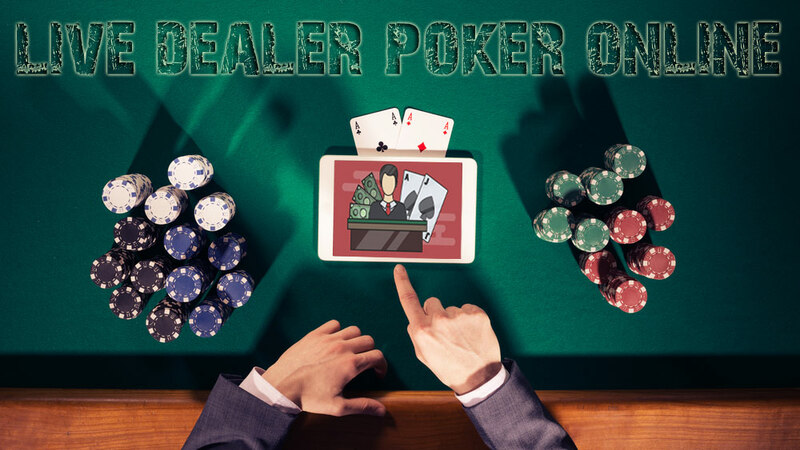 Live dealer poker online, as well as other live dealer games have served to alleviate these worries. Rather than playing against computer software, players are playing against real dealers. Much the same as in a real-life casino. The dealer can be seen shuffling and dealing the cards, as well as spinning the wheel and tossing in the ball. To the average persons eye, this means the games are much less likely to be rigged. The social side of live dealer games is another reason for their increased popularity. Sitting in front of a computer and playing against software can be a little boring. The social aspect of playing casino games, which can be enjoyed in a bricks and mortar casino, has been historically lacking in traditional online casinos. Live dealer casinos have turned this around completely and it is the one aspect which has made this type of game so popular. Players can interact with other players through chat boxes, as well as chatting with the dealer. Questions can be asked and conversations started. Dealers are free to interject and get the ball rolling if the game is a little quiet. Not every player who visits a live online casino in the UK is looking to win loads of money. A huge number of players enjoy live poker online because it’s a fun way to spend a few hours. Fun is the primary reason for playing live online casino poker. Not the chance of winning. Roulette is a prime example of this because playing the traditional game online can very quickly become boring. Playing at a live dealer casino means there are other aspects to enjoy. For example, it’s possible to communicate with other players and the dealer, watch other players winning and uncover any hot streaks, as well as enjoy seeing other players reactions. Is there a downside to playing live dealer poker online? Players who enjoy playing a fast-paced game won’t be too impressed with live dealer games. It takes time for the dealer to deal the cards and for the roulette wheel to stop spinning, and there’s also the wait for other players to make their bets. Many players will also find the games a little too staged for their liking, but that’s really more of a personal thing. Apart from these, there is very little to say against playing live poker online.